Another one of my "By The Numbers" reviews. 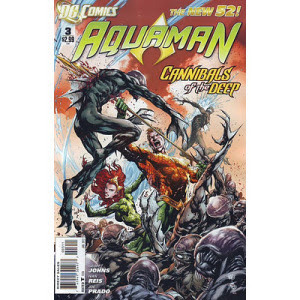 Another fun one to do, especially when I liked the early issues of Aquaman. Originally published on December 30, 2011. Edited for clarification, spelling and grammatical errors. Apparently I didn't know how tell the difference between "its" and "it's" yet. 2. There's already been revamps done by Peter David and others to make Aquaman relevant. The Aquaman out of water jokes have already been done. To do it again in less than twenty years seems a bit much. 3. 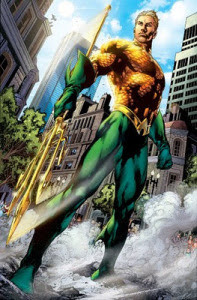 And did Aquaman ever need this much of a revamp? 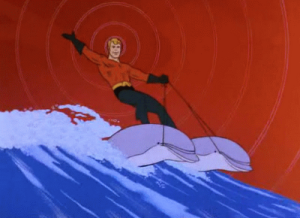 You might be wondering this too if you took to Aquaman as depicted in the Batman: The Brave and The Bold cartoon. In it, he's vain, badass, yet altruistic, friendly and above all, unapologetic in his presentation, especially when contrasted with this new version. 4. That cartoon made me even consider the Super Friends version. Take the picture below, taken from one of the show's many intros. 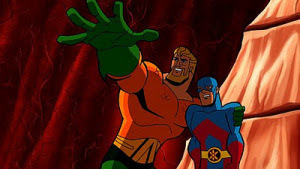 Since the recent Brave and The Bold cartoon, I look a that imageand hear Aquaman is saying, "That's right. I'm riding dolphins, and I just summoned a legion of small and large fish. What did you do today"
5. It's odd that Johns is trying to implement the real world view of Aquaman (with its numerous jokes as heard on shows like Saturday Night Live and Family Guy). And yet, in this revamped DC universe (according to Justice League title by the same writer), all superbeings are regarded with suspicion and even fear. If that's the case, would Aquaman be an SNL skit? This seems like a case of a writer wanting to have the cake and eat it. Johns tries too hard or not hard enough to make this work in issue #1. 6. So what does work? Well, Ivan Reis, who, with Joe Prado, turns out pages like the one below from the first issue. It's art that that (better than any recent Jim Lee pages I've seen) is what convinced me to buy the second issue. Not the weird pop culture references and other in-jokes. Thankfully, Johns writing steps up a bit, maybe deciding less is more with the water jokes. 7. By issue #2, the story moved to straight action, peppered with hints of Aquaman's new (newish?) origins. A new underwater race has emerged from the depths and is looking to eat humans. Aquaman is (reluctantly) called in to help, fights ensue. All the while, there are hints of his history that get dropped and no doubt help to set up future storylines. There's some hints of the Alien movie in this underwater race. Not sure how I feel about that. At least it's somewhat subtle, unlike Chris Clairmont's creation of The Brood. 9. This first story took four issues from start to finish. It was a nice, straightforward tale. I wish more of the New 52 titles were like this. 10. This introductory story also introduces Mera, Aquaman's wife, as his sole companion and partner in battle, both apparently self-exiled from Atlantis, which in this New 52 world is not even believed to exist. No children, though, which seems to explain why they're so happy together (when Johns has depicted other heroes with spouses and kids, they seem so miserable sometimes). 11. He lives in a Lighthouse now, which is fine. Spider-Man needs tall buildings to swing from. Aquaman needs water. Both heroes would have a sucky time in the desert for different yet similar reasons. Do you make fun of Batman because he wouldn't work in New Orleans during Mardi Gras?? 12. Actually, if you saw the Brave and The Bold Cartoon, you realize Batman would totally work in a Mardi Gras setting. 13. I hope that the Aquaman title can give me similar self-contained stories for a while. I'm afraid that Johns has a Atlantis-themed crossover spanning all titles. Johns can't seem to work his head around a character until he throws them into a crossover event. Not even the Barry Allen Flash, who prior to Flashpoint had already already starred in two high profile company crossovers (and died in the first one ever done). Then of course there was the whole attempt to turn Green Lantern into Lord of The Power Rings. I like Aquaman's current simpler vibe much better. 14. That's all I'm going to say. 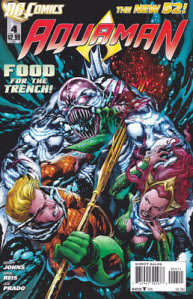 Aquaman has a "ain't broke/don't fix it" vibe around it, but it's gotten over some of its weaknesses in the first issue to deliver the goods. Grab it while the fun and the sweet art lasts.